In October 2017, the International Making Cities Livable Awards Competition Jury selected Sundance Square to receive the IMCL Honor Award for “Excellence in creating Public Places for Community, Democratic Dialogue, Health & Equity at the recent 54th IMCL Conference in Santa Fe, NM. The Sundance Square was also named the recipient of a 2014 Downtown Pinnacle Award by the International Downtown Association. In 1988, the architects were commissioned to create a development plan for downtown Fort Worth, focusing on a 36-block pedestrian core. The downtown area’s grid was littered with pedestrian barriers, multi-block parking garages and unpleasant street edges created by office buildings set back a considerable way from the sidewalk. A central plaza was sited in that original development plan over 25 years ago but it was not constructed and completed until 2013. The plaza was formerly occupied by two surface parking lots. Photo provided by David M. Schwarz Architects. Photo of the original parking lots. Provided by David M. Schwarz Architects. Sundance Square, a plaza named after the surrounding neighborhood, was considered a critical element to creating a truly walkable and inviting urban center. The parcel on which the 55,000 SF plaza was constructed was formerly occupied by two surface parking lots on either side of Main Street. It took 18 months of constructions to turn the parking lots into the plaza with completion in November 2013. The portion of street that bisects the site was permanently closed to accommodate the programmatic demands of the space and made the area more pedestrian friendly. Twelve curb extensions allow the plaza to interact with the rest of downtown and improves accessibility for pedestrians. 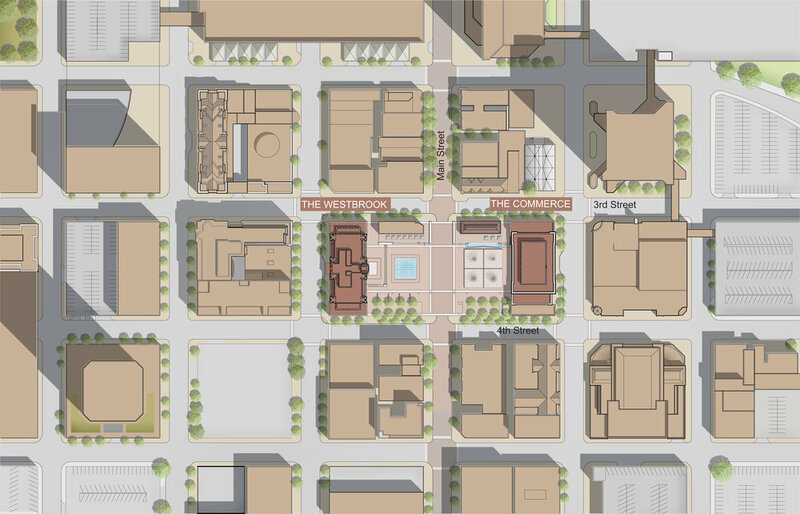 The square is book-ended by Class-A office buildings, The Commerce Building and The Westbrook, with ground-level retail and restaurants both on the square and the streets the two buildings face. Today the plaza square is surrounded by museums, galleries, restaurants, and night clubs; furnished with a forest of 216 fountain jets, a wave wall fountain, a rentable pavilion and terrace, four 40’ x 40’ umbrellas, and a stage; and thoroughly programed for concerts, theater, art festivals, and movies. The square is large (approximately 200’ x 300’ - 55,000 square feet), framed by 5 – 12 story buildings. The two existing historic buildings on these blocks, the Jett Building and the Land Title Building, were left largely untouched and were incorporated into the overall development of the site. Two new buildings were designed to book-end the Plaza: a building on the west side of the Plaza sits on Houston Street; a building on the east side is on Commerce Street. Both buildings include ground-level retail with office space above. The location, size and design of the new buildings accomplished several goals: enhance the vibrant street-level retail along Commerce, Houston, 3rd and 4th Streets; provide appropriate physical enclosure for a civic plaza commensurate to similar spaces in America’s top tier cities; provide class A office building footprints with location, amenities and views that will appeal to businesses looking to locate in downtown Fort Worth; and continue the tradition of making buildings that are both timeless and beautiful places for the city of Fort Worth. Materials were chosen to be extremely durable, timeless and capable of being manufactured or fabricated locally. A multi-purpose stage anchors the plaza’s west end in front of The Westbrook Building and the iconic clock tower. Permanent stage lighting and audiovisual equipment are positioned within the plaza for maximum entertainment capabilities.The stage is a showcase for live music, outdoor movies, and other performances. Credit: Sundance Square. Sundance Square is a vibrant 35-block commercial, residential, entertainment and retail district where people work, live, shop and dine among beautiful landscaping, red-brick streets and turn-of-the-century buildings. The multi-use development attracts more than 10 million visitors each year. More information about Sundance Square can be found at www.sundancesquare.com.